The exhibition “End of Recursion time of a sea gull” by Ryuta Iida will be held at the gallery SLANT. He has created sculpture works made of papers like books, prints and etc. using the technique he learned when he was student. By chopping the materials in sophisticated way, he produces “new 3D works” woven textual data, symbols and even bindings they have originally. He has gained a fine reputation with his cross-sectoral expression, his showcase using spaces by architectural approach. 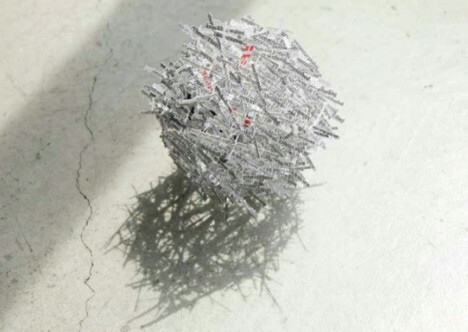 In this exhibition, his new installation resembles a series of steps made of “the Complete Works of Ogai MORI”, a spherical object made by book cut out English letters will be showcased with the theme “recursion”.